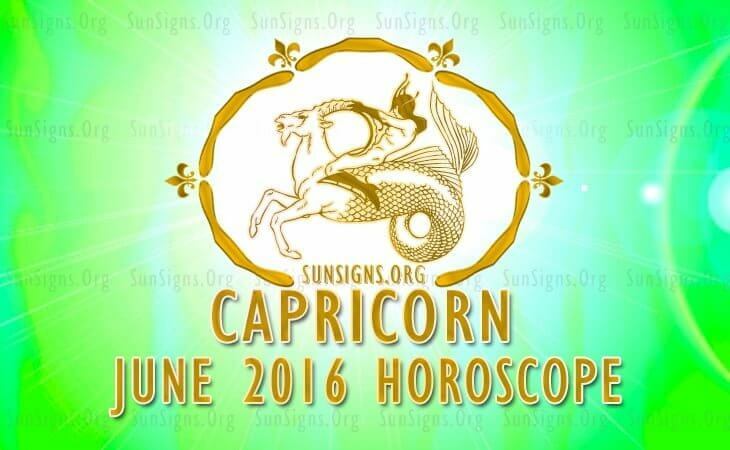 June 2016 Horoscope for Capricorn predicts that you will have to focus on your careers. You had enough time to strategize your career plans and build your emotional strength sufficiently. Now you can ensure that those plans take shape through hard work. The Capricorn zodiac sign people can also expect a lot of activity on the social front. Be ready for a few surprise dates with your loved one or an official trip. Proper use of social skills will boost your prospects in life. Now is not the time to think of your gains. June 2016 will revive your interest in scholarly activities and you will make serious efforts to improve your communication skills. The Capricorn 2016 June astrology forecasts suggest that achievements in your profession can be attained through diligence and there is no short cut to success. You will have the wholehearted support of your friends and social contacts in your business endeavors. Job seekers have very good prospects of getting employed this month. Financial situation in June 2016 for the sea goats requires more tolerance as the pace will not be up to your expectations. Situation will improve later and you should enjoy your life while you are waiting for things to happen. Your spouse will have better luck with finances and will be a source of support for you. Capricorn, June 2016 will be a fabulous month for getting into romantic alliances. Singles will have plenty of chances to form relationships. Serious partnerships will progress to the next level and may culminate in marriages. Influence of Venus will impact creativity and the behavior of children. There may be conflict with children and they can become obstinate. Lot of socializing will happen this month. You should avoid conflicts with your partner and tone down your assertive attitude. Pregnancy related issues need to be discussed carefully. The Capricorn June 2016 monthly predictions warn that proper health care is essential after the 21st and your awareness about health will be of great help in maintaining your fitness. Health can be improved by alternative therapies like meditation, yoga and by taking sufficient rest. You should pay attention to maintaining balance within your social circle to be healthy. Drinking too much will only end up in a bad hangover. You can enhance your fitness by resorting to cleansing your body of toxins. Rigorous exercise and diet regimes will help you to remain fit. Your vitality will see a drastic improvement during this period. To conclude, the June 2016 Capricorn horoscope forecasts that this will be a socially busy month with lot of parties and official networking.